This week has been busy, and I am feeling a tired. Monday evening Josh and I prepped dinner for Tuesday night, made dinner, and then we went our separate ways. I went to our friends home and sat on their couch for a few hours while their sweet little girl slept, and they had a date. The smiles on their faces after having a night out of the house as a couple, not parents… priceless. I would sit on their couch every night if they asked me to. It was great, I got to sit in a quiet, clean home, and enjoy some silence…. and Josh got to spend a few hours doing homework. Everybody was happy. Tuesday was a major bill paying day at work. My desk was covered in paper, and I loved it…. every single second of it. Plus, it was my sister in law’s 12th birthday and I got to talk to her over lunch. (Can we talk about how crazy it is that I have so many sisters in law? I definitely never expected to have any so young! But man is it fun.) When I got home from work Josh and I went to vote. 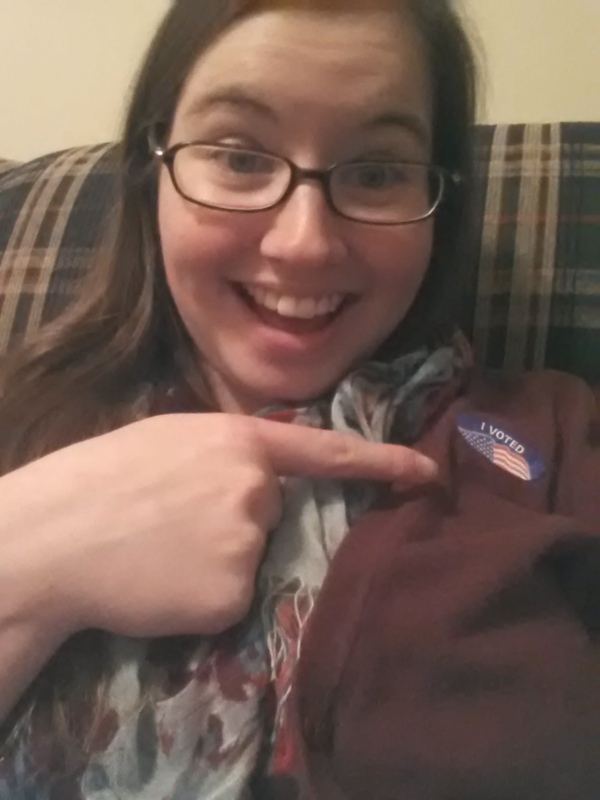 It was a pretty big deal because it was my first time voting… I’m glad Josh encouraged me to do it. After we voted, we went home to finish the meal for Growth Group. Man, it hit the spot. The cheesy chicken and rice (recipe here) warmed us from the inside out and we topped it off with apple cake… which included a cream cheese filling and caramel icing (recipe here). It was encouraging to hear the silence and the “mmmm”s of people eating the dinner we prepared. Tuesday was a good “see, I can do things right!” day for Deborah. PLUS my husband led the group for the first time. Maybe I’m biased, but I just think he’s the best… and I love the passion he has for scripture; both the understanding and application of it. I’m so excited to see him grow in this role, and adapt new roles of leadership. Josh and I stayed up until 11pm (everyone knows that is insanely late for me) watching the election progress. I’m a little competitive… so I kind of had to know my peeps were going to make it or not. Wednesday, I did the basic morning stumble… shower, sandwich, coffee, drive to work. Staff meeting. Chasing paperwork from guys at work. Filing. Emails. Deposits. I’m counting down the minutes to my lunch break, and I’m trying to decide whether I’m going to Target or to read. This afternoon holds more filing, paying bills, and creating AIA billing documents. This evening holds grocery shopping and a date with my man. We’re going to Olive Garden! Maybe some pumpkin bread baking for my sister, Grace… but most certainly leaving work at 5pm. Until then, I will keep on working until the work is done, and enjoying my Civil Wars Pandora station. I am really looking forward to our date night! We don’t go out a ton, but it’s always nice when I don’t have to worry about dinner. Not going to lie, I’m pretty sleepy today… but I’m glad we went out and voted, and then tracked followed the results. (Also still can’t believe that Clay Aiken is involved in politics. So. Weird. Sorry I insinuated your were insane for saying it was the singer and that I did not exactly reply with “you were right and I was wrong.”) We’re pretty good for each other. You make me vote and I make you eat salad. Speaking of salad… Olive Garden. I’m excited about date night! I am so proud of the way you led our group last night. I’m thankful for the way you taught us, the ways you have taught me, and the ways you will teach our kids (one day). One of the things I’m most thankful for is that I don’t feel stupid for saying “hey I don’t understand this: will you discuss it with me?” That’s proven so valuable when discussing scripture, politics, and even our budget. I’m thankful for the big ways you love me, and the little ways like taking me to vote and bragging on my baking skills to other people.